These new levels, initially available in Spanish and English, will include extended, more complex conversations and grammar, expanded vocabulary and additional opportunities for speaking that prepare learners for everyday interactions in their language of study. Wall Street Survivor lets users navigate the stock market without investing any real money. Players are given a fictional $100,000 cash portfolio to start trading real stocks in real time, providing the foundation for students to understand better how investing works. Burst: Reading applies a sophisticated algorithm that analyzes current and past reading-assessment data for a given class, groups students with similar skill needs and then creates a customized 10-day sequence of lessons arranged at the right pace and intensity for each group. At the end of the 10 days, the teacher evaluates students’ progress using Wireless Generation’s mCLASS handheld-computerbased reading assessment and uploads students’ results to the mCLASS Web site. The Reading Assistant readingintervention software combines advanced speech-recognition technology with scientifically based interventions to help elementaryand secondary-school students strengthen their reading fluency, vocabulary and comprehension. With PBwiki Campus Edition, a school can roll out an unlimited number of PBwikis for its classes, clubs and other student activities. Educators have used PBwiki for everything from classroom collaboration and publicly accessible student projects to open-source textbooks. This software program helps children with autism, Asperger’s and developmental deficiencies learn how to recognize facial expressions that display the emotions of surprise, fear, disgust, anger, sadness and happiness. 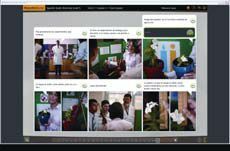 PD In Focus provides searchable streaming-video content of researchbased teaching practices in action. The video content is organized into four themed channels (Best Practices in Action, Differentiated Instruction, English Language Learners and Literacy Strategies) and draws from the best of ASCD’s professional-development library and authoritative sources. Price: A single school starts at $679. PLE combines 21st-century technology with PLATO Learning’s curricula, assessment and standards management to create a unified system for integrating the key aspects of the educational process. This latest release adds new features and functionality upgrades, including the Create Custom Resource tool, teacher and student communication tools and enhanced batch enroll features. Progress Zone from Discovery Education is the first formative assessment service enabling educators to monitor student academic progress through teacher-created diagnostic tests linked to standards- aligned digital media. Progress Zone allows educators to quickly create, share and administer custom academic probes using a bank of more than 35,000 unique assessment items. All items are aligned to state standards with skill/sub-skill definitions. The Progress Zone item bank contains reading, math, science and U.S. history questions for grades 1 through 12. The Consortium on Reading Excellence (CORE) has partnered with Teachscape. Together with intensive professional development, on-site support for reading and math, and Teachscape’s online resources, CORE will be able to deliver a 24/7 professional-development program for literacy and math educators. Teachers will be able to study material at their convenience and review the information as many times as necessary to perfect skills relating to a topic or concept. The Digital Scrapbook Artist is a photo-realistic digital scrapbooking software program. Features include high-resolution images, built-in photoediting tools and digital versions of traditional scrapbooking and crafting tools like stickers, glitter and stylized scissors. LargeSoftware has announced a price special that will provide customers a discount on the popular PC Tune-Up 2.0 software when combined with the purchase of the company’s Password Manager. The PC Tune-Up 2.0 product optimizes users’ computers and improves computer speed by up to 55 percent. ActivInspire is Promethean’s next generation of teaching and learning software. It combines cross-platform functionality that works on Windows, Mac and Linux with two interface options, ActivPrimary and ActivStudio, to create a complete educational-software solution. The online Economic Recovery helps educators access up-to-date information about the American Recovery and Reinvestment Act of 2009. The information portal provides educators with FAQs about how the ARRA will directly affect their schools and districts, quick links to Web resources, programs and resources that align to funding for Title 1 and more. SmoothWall has released the latest version of its School Guardian Web filter. The key feature in the new version is SSL Interception, allowing organizations to control and monitor encrypted traffic. This will be welcome news to many IT staff, since 49 percent of 13- to 17-year-olds admit to using anonymizer tools like Ultrasurf and VTunnel to browse in secret. The Bee Docs Timeline software for Mac OS X makes it easy for teachers to present historical events in a way that reveals connections and clarifies relationships. Make time-line charts of world history, family trees or fictional events. Bee Docs Timeline 3D allows teachers to present the details in time lines as well as the surrounding historical events as context. color sampling, which is important when recording chroma-key footage. In addition, enhancements to the real-time MPEG-2 encoding technology yield significant improvements in quality, with a lower compression rate, for broadcast-quality video recording. project handwritten notes from a pad of paper to an overhead screen by using a Bluetooth pen, a USB key and interactive paper. Teachers can edit presentations, write notes, draw helpful diagrams and host brainstorming sessions, all in real time. Convey Enterprise 4.3 software, which allows schools to aggregate data and lets teachers share formative and summative assessment curricula to meet learning standards. View wall-mounted projection screens. The new 4:3 TVShape Video View models are calibrated to the standard TV size, so viewers see an image that looks correct, whether they’re in a classroom or a conference room. The new screens have a 1.0 gain for the best all-around viewing surface. easy maintenance and the ability to project an 80-inch image from 25 inches away. This means that teachers no longer have to worry about obstructing the projected image when they stand in front of the screen. Additionally, there are no shadows to interfere with the image or any light in the presenter’s face. The CP-A52 also has a hybrid filter that requires maintenance only every 2,000 hours. The projector’s saving mode reduces power consumption to less than 5W by disabling RS-232C control except for power-on command, monitor-out and audio capability. customize for use with a computer lab. Zido is a small, sturdy mobile cart with a slate-blue-colored frame on four-inch casters. The Zido shelves have a weight capacity of 50 pounds, and the entire cart has a 150-pound overall weight limit. There are more than 16 options that can be added to Zido. PG-F267X Projector purchased by K-12 educational end-user organizations between now and June 30, Sharp is offering a free “classroom pack” of 25 Sharp WriteView EL-W535B Educator Scientific Calculators, with an estimated total retail value of $325. Sharp’s PG-F267X is the company’s first short-throw DLP BrilliantColor professional projector, combining the high brightness and convenience of a short-throw design with the fine image quality and reliability of BrilliantColor DLP technology.